5 Kenyans won gold medals in the 2014 Inter-Continental cup held in Marrakesh Morocco. Each win came with a $30,000 prize as well as bagging 8 points for team Africa. Kenyan sprinter Boniface Mucheru Tumuti was part of the team Africa 4 X 400m team that upset the form book to in the gold medal at the 2014 IAAF Intercontinental cup. 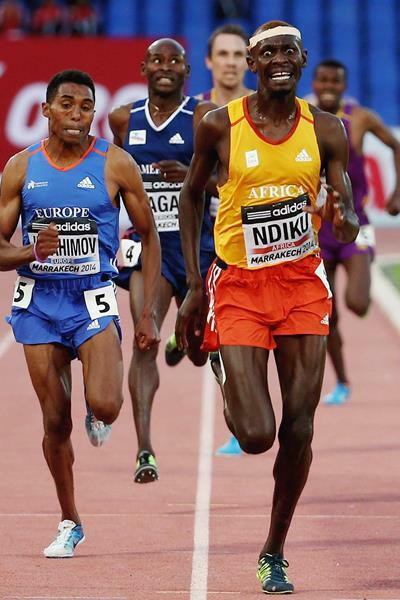 Tumuti had qualified for the team by winning the bronze medal at the 2014 Africa Athletics championships. In this race, Tumuti ran the first leg. The other members of team Africa were Isaac Makwala of Botswana, Saviour Kombe of Zambia and Wayde Van Nierkerk of South Africa. Team Africa won in 3:00.02 ahead of Europe and team Americas which had world and Olympic champion LaShawn Merritt. Caleb Mwangangi Ndiku has had one heck of a season. He is the only athlete in world this year to have won at World Indoors, Diamond Race, Inter-Continental Cup and Continental (Euro/African )Championships. Eunice Sum comprehensively beat the field in the women’s 800m at the 2014 IAAF Intercontinental cup. It was sweet revenge for Sum who had lost to Britain’s Lynsey Sharp and American Ajee Wilson in succesive Diamond league races. This time she beat both of them as they found her pace over the last 100m too hot to handle. In the process she recorded her second fastest time of the year. 2014 has been a glorious season for Sum. She won eleven 800 meter races this year and lost three. She won the African championships and won the Commonwealth games gold.She also won the overall diamond league title that comes with a $40,000 bonus. 2013 world championships bronze medalist, Isaiah Koech ran a blistering last lap in 54.09 seconds to win the 5000m and in the process bagged 8 points for team Africa. Former Kenyan Albert Rop who now represents Bahrain finished 4th for team Asia. It has been a nondescript year for the 20 year old Koech. He did not win any Diamond league races this year but at only 20 years of age, he still has a lot of upside. Jairus Birech ran a storming 58 second final lap to win the Continental Cup over Evan Jager in 8:13.18 , thus capping a dominant year. In 2013, hardly anyone knew who Jairus Birech was. The 3000m steeplechase was still dominated by Ezekiel Kemboi and his closest challenger was the youngster Conselus Kipruto. In 2014, Jairus Birech has dominated this event thoroghly. He won every diamond league race by significant margins. In the men’s 1500m, Asbel Kiprop was upstaged by fellow team Africa member Ayanleh Souleiman who ran the 3rd fastest final lap ever. Kiprop took silver. It has been an up and down year for Kiprop which started with him getting arrested for disorderly behaviour in March. Joyce Chepkirui took silver in the women’s 5000m Julius Yego finished a dissapointing 4th when he tossed the javelin a distance of 83.06 . Fellow team Africa member Ihab El Sayed took gold. Nevertheless it has been a super year for Yego in which he won the Commonwealth and African championships. Europe won the overall standings by ammassing 447.5 points. Team Americas was second with 390.0. Africa finished 3rd with points with 339 points. Asia was 4th with points 257.5 points. This entry was posted in Kenya Athletics News, Kenya Sports news and commentary and tagged asbel kiprop, boniface mucheru tumuti, caleb ndiku, Eunice Sum, isaiah koech, jairus birech, joyce chepkirui, julius yego. Bookmark the permalink.